NetScream is a tool for all that allows you to modify your modem settings to increase internet performance up to 200% or higher!! No modifications to your hardware are made and all adjustments and settings are done in a very straight forward and easy-to-use interface that a child could use. Most other modem enhancers promise that they work while you notice no difference at all in internet speed. 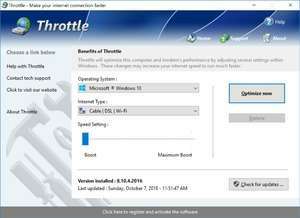 For security reasons, you should also check out the Throttle (formerly NetScream) download at LO4D.com which includes virus and malware tests. Additional screenshots of this application download may be available, too. 3.2 out of 5 based on 9 ratings. NetScream has a presence on social networks.